How about those three handsome brothers on The Big Valley? 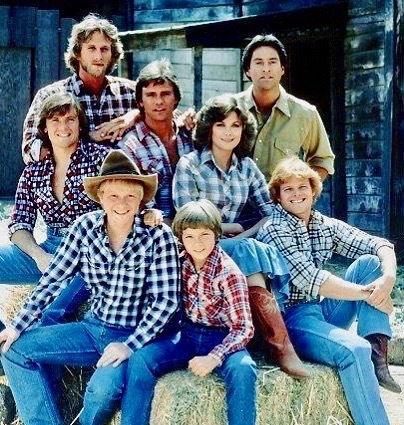 Did anyone watch the TV version of Seven Brides for Seven Brothers...? It aired on CBS during the 1982-82 season. A full order was produced (22 episodes) but it never rose higher than 65th in the ratings. Part of the problem-- some of the guys were not very musically inclined. The cast included Richard Dean Anderson, Peter Horton, a young River Phoenix and Drake Hogestyn before he found fame on Days of Our Lives. Not sure if MGM has ever released this series on home video. It would be fun to take a look at it again. Cute. Someone obviously spent a lot of time going over the various episodes to find all those clips and assemble them together. CHiPs was a fun show. Larrry Wilcox was so "hot". That face, that chest, that derriere - Robert Conrad (James West) was just so "hot"!! "That face, that chest, that derriere - Robert Conrad (James West) was just so "hot"!!" I've never seen the show, but I first heard of it while reading a biography of River Phoenix. (I still miss River so much.) In the picture, it's clear to see how beautiful he would become. Supposedly Michael J. Fox auditioned for a role in Seven Brides for Seven Brothers. But around the same time he'd also auditioned for Family Ties. And as we know, the rest is history. I wasn't aware River Phoenix had guest-starred on FT. I must have missed that episode. Supposedly Michael J. Fox auditioned for a role in Seven Brides for Seven Brothers. But around the same he'd also auditioned for Family Ties. And as we know, the rest is history. I wasn't aware River Phoenix had guest-starred on FT. I must have missed that episode. I did not know Michael J. Fox auditioned for Seven Brides for Seven Brothers. Kirk Cameron said River auditioned for Ben Seaver (Alan Thicke's youngest son) on Growing Pains. Imagine how different the show would've been if River got the part. I wish someone would write a book about the auditioning process back then. Not the parts that could have been had by other actors, but the whole culture of these people competing for roles and seeing each other again in casting offices. There's a great deal about the auditioning process in that new bio on James Dean, "Tomorrow Never Comes". Especially among actors who were as ambitious - and as devious - as James Dean. In so many cases, there's far more than talent involved. Paul Newman was always upset that, everytime he auditioned for a role, James Dean was auditioning, too. Interesting, Ray. But I don't think I'm interested in learning about the deviousness of the auditioning process. I'm more interested in how some of these people competing for roles are friends, may have even studied together in a college theater department, done previous productions (like college plays or off-Broadway stuff) together. Yet for some reason they seem to go up against each other for the same parts. I'd love to see a documentary about this, following two similar actresses and two similar actors. I wouldn't even want them to be young. This could be just as interesting from the vantage point of two over-50 women who are competing for roles when roles are even harder to find for gals their age. I'm a firm believer in "the right person gets the right role." And I think most people competing for parts during the auditioning process eventually accept that fact. So it becomes less about competing and more about finding the right role and making something out of it when casting occurs. This morning I read a great article about a former soap opera actress who says a role she became strongly identified with came down to her and another actress of similar type in the final auditioning process. She thought for sure the other gal would get the part because the other gal had more experience on Broadway. But when she went to the ladies room after her audition she bumped into the casting director and they started admiring each other's skirts and talking about clothes. The casting director felt this actress would be better because of her high fashion sense and ended up choosing her over the more experienced Broadway actress. So clearly the person who was meant to get the part was chosen, because of this fateful conversation in the ladies room! This kind of stuff is more interesting to me than people sleeping their way to the top. It's about having the talent but also having good people skills and showing that you have something extra. Something which will make others notice that you will do justice to the part. This is going way off-topic, but there's a really interesting book (The Night and the Music) which follows the late-in-life careers of three women competing for bookings in the dwindling club and cabaret scene in Manhattan. The women were Julie Wilson, Barbara Cook and Rosemary Clooney and the book basically tells about their daily lives as they tried to remain viable working artists. Julie, for example, was priced out of Manhattan rent-wise and lived in New Jersey, commuting to gigs by bus. They all persevered, but it was a struggle. 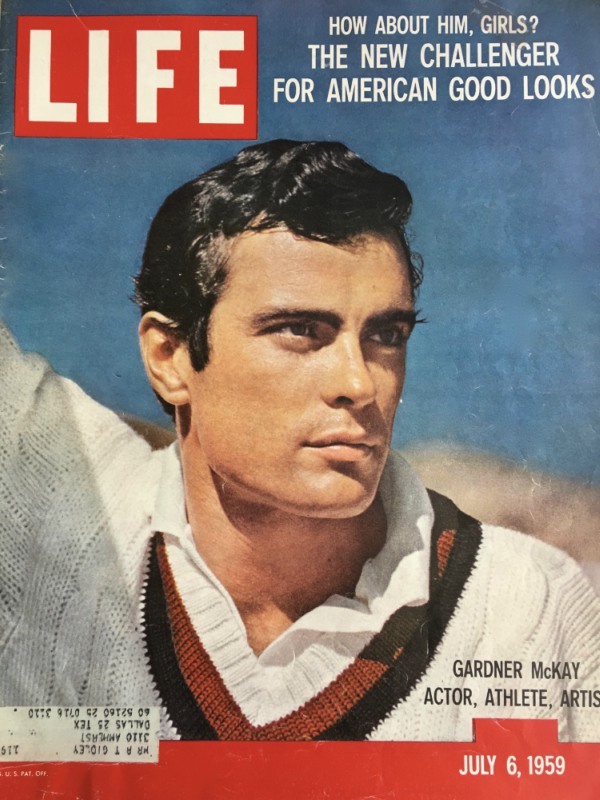 Back to topic....I'm having trouble posting pictures, but no discussion of hot TV guys would be complete without mention of the heavenly Gardner McKay, star of Adventures in Paradise. Sounds interesting. I appreciate your going off-topic to tell me about this. Thank you. Antony Hamilton was probably one of the most attractive men on TV in the 1980s. After the accidental death of Jon-Erik Hexum (another attractive male TV star from that era), the producers of CBS' action adventures series Cover Up created a new sidekick for Jennifer O'Neill. The opening credits show Hamilton in soldier's uniform and in cowboy garb (the shot of him riding into view is very memorable). He's also in a tuxedo, and in another shot he emerges from a swim weaing a pair of Speedos.